Smallfoot is an ingenious lesson in critical thinking, adroitly delivered via CGI animation. I certainly did not expect a children's film about a yeti to be so intellectually stimulating. 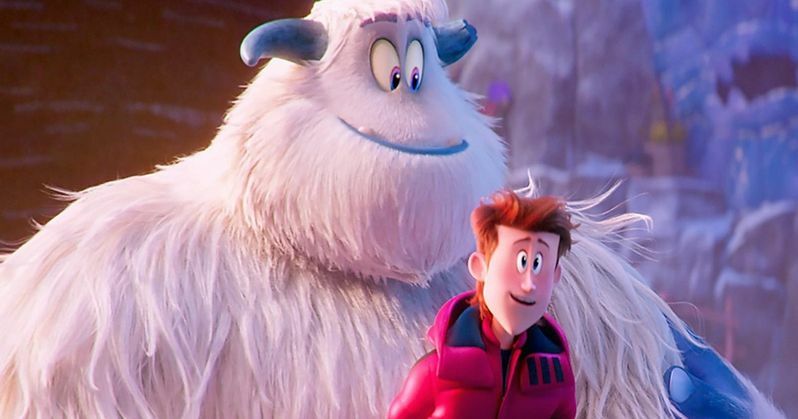 Every kid who sees Smallfoot will leave the theater a bit smarter, and perhaps more curious about their environment. It's also hilarious, laugh out loud funny in parts. The humor is equally as clever as the plot. The only drawback is the music. The songs are perfunctory, distracting from Smallfoot's brilliance. Smallfoot takes place high atop the Himalayas. On a cloud shrouded mountain, a village of yetis live in peace and harmony. Their entire society strictly adheres to rules written on stones by their ancestors. Channing Tatum voices Migo, who is apprenticing to replace his father (Danny DeVito) as the village gong ringer. A failed practice run at the gong hurls Migo down the mountain. The accident leads Migo to an encounter with a creature of legend, the mythical Smallfoot. No one in the village believes Migo. The Stonekeeper (Common) is convinced that Migo discovered a new species of yak. But his daughter, Meechee (Zendaya), has long harbored suspicions of life below the mountain. She and her goofy cohorts persuade Migo to find proof of the Smallfoot. Meanwhile, in a Nepalese village below the clouds, a human TV star (James Corden) with dwindling ratings is looking for the next big story. At the core of Smallfoot is the idea of challenging beliefs. Where do the rules come from? What happens if we don't follow them? Director Karey Kirkpatrick, who also wrote James and the Giant Peach and Over the Hedge, imbues sophistication in the characters. Migo cannot go back to his life as the gong ringer. He's seen something that shakes the pillars of his society. Smallfoot's screenplay, written by Kirkpatrick and Clare Sera, becomes even more impressive once Migo truly understands the ramifications of his newfound knowledge. Civilization dwindles precariously on the edge of anarchy and chaos. The rules exist for a reason. Migos must choose between enlightenment, or possibly endangering everything he's ever loved. The heady themes are stealthily taught. Smallfoot is a kid flick through and through. A toddler can watch and be tremendously entertained. The film is loaded with gags. They range from pratfalls to side-splitting interactions. One of the best running jokes is the language disparity between humans and yetis. Humans sound like squeaky mice to the yetis. While the yetis sound fearsome with their loud growls and shreeks. This bit never gets old. One scene in particular had the entire audience roaring with laughter. Smallfoot teaches children how simple misunderstanding in language can have serious consequences. Smallfoot would have been much better without the annoying soundtrack. The characters break into song constantly. This wouldn't be bothersome if the songs weren't so blase. They seem like a marketing decision foisted on the filmmakers. Smallfoot needed to have songs that matched the quality of the story. They had to be exceptional. Only one, a remake of "Under Pressure", had my shoes tapping. The rest are forgettable. Warner Bros. has a serious contender for all the animation awards. Smallfoot borderlines greatness. The tiresome music is a negative, but I wholeheartedly recommend this film. Smallfoot has a unique story with real depth. It promotes intelligence and understanding, far superior to the usual brainless dreck aimed at kids. Night School Vs. Smallfoot: Who'll Win the Weekend Box Office?